The garden and I have not spent much time together this summer. I’ve been busy… there was weather… there have been too many days when I didn’t feel like going outside. Since the courgette and summer squash started fruiting, I’ve been a bit afraid to go outside in case there’s a mountain of fruit to pick. 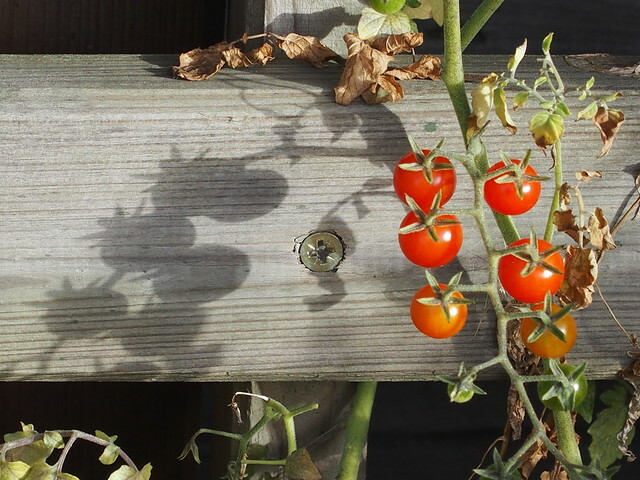 But the light was nice this morning, so I ventured outside to take a few photos (and the squashes seem to be slowing down, so it’s safe). 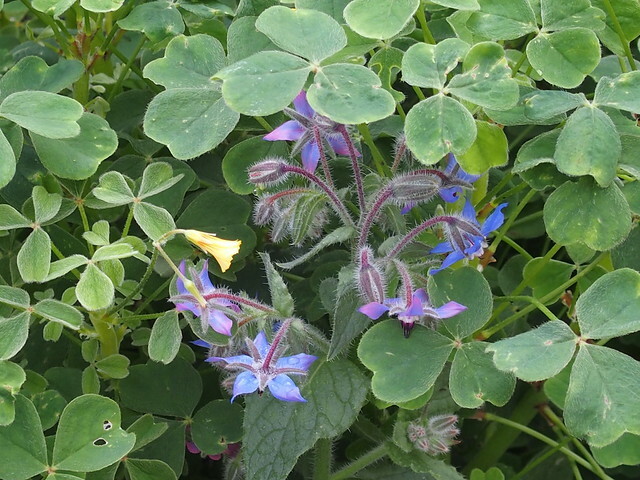 It’s a lovely little still life, a combination of self-seeded borage and the oca that are just starting to flower. I can’t understand why people think edibles are ugly; they can be pretty as a picture. 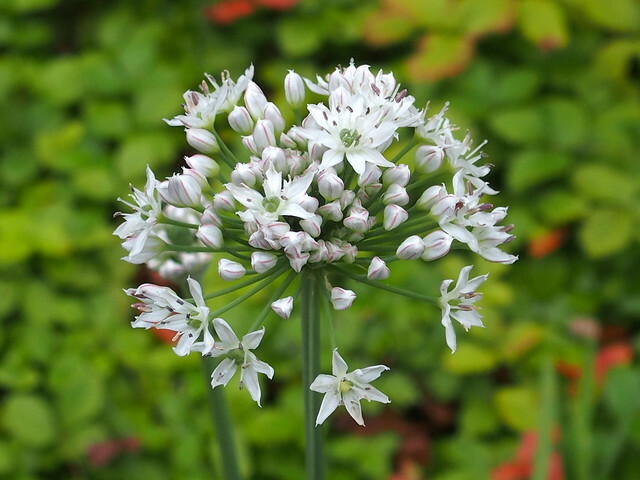 The garlic chives (Allium tuberosum) are flowering in the front garden. 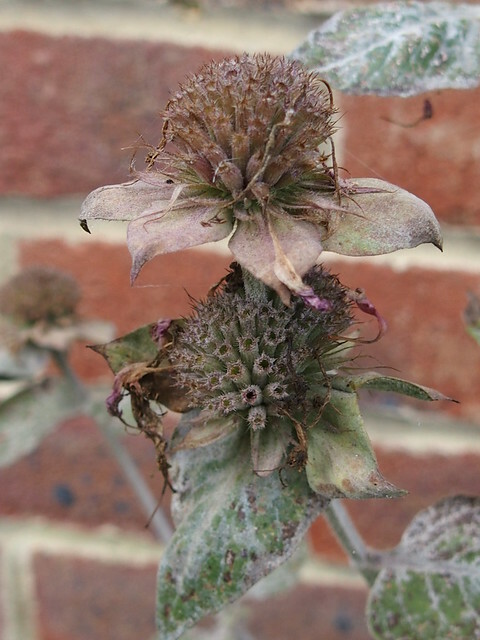 And there’s a touch of the Miss Havisham about the bergamot, whose flowers have succumbed to mildew and autumn and yet still have a stately charm. 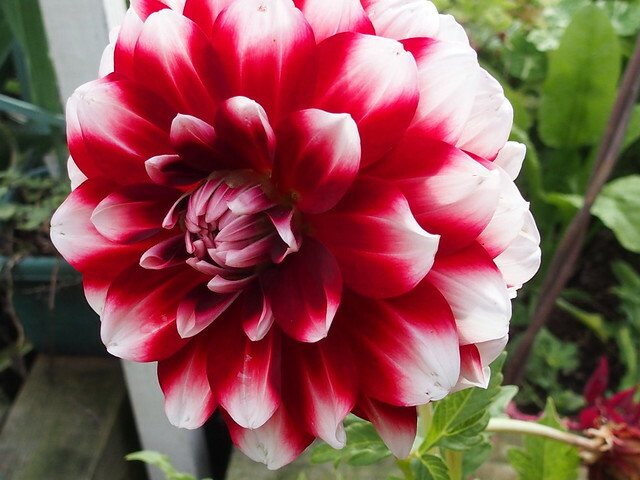 I’ve neglected the edible dahlias this year, but my favourite has survived and is flowering in a container (it’s DeliDahlia Hoamatland, from Lubera). The English Mace has gone a bit nutty, which is impressive because it’s still in a tiny pot. I suspect it will have rooted into the bed beneath, where I plonked it earlier in the year. 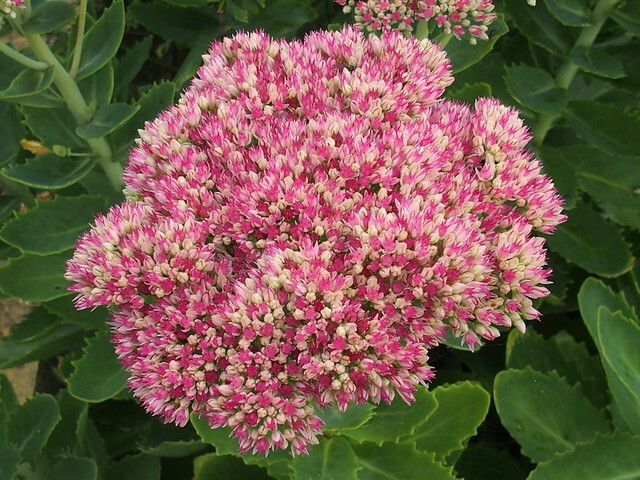 The orpine is doing its late summer ‘come hither’ display for the bees. 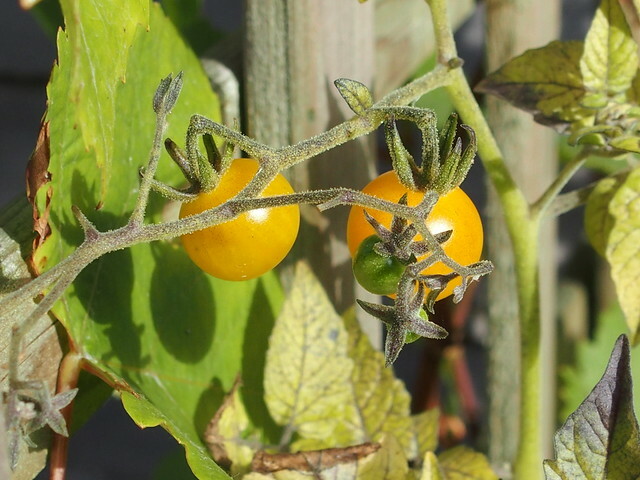 These are tiny currant tomatoes, Solanum pimpinellifolium, rather than the standard S. lycopersicum. I tried in vain to get the achocha (Lady’s slipper, Cyclanthera pedata to climb my canes in early summer, and it has sulked ever since. 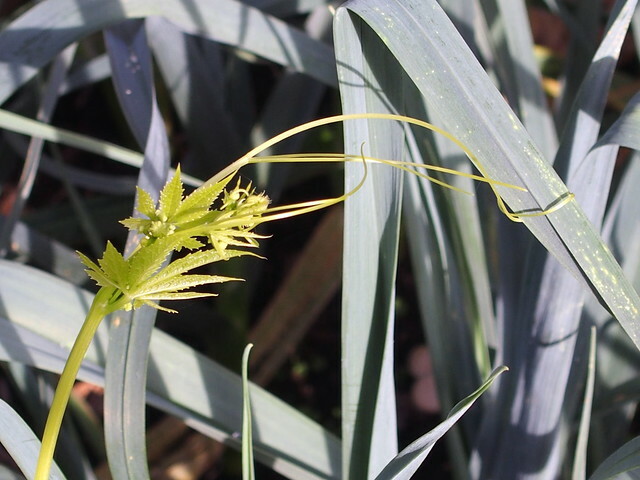 Ever contrary, it has now decided to flower…. 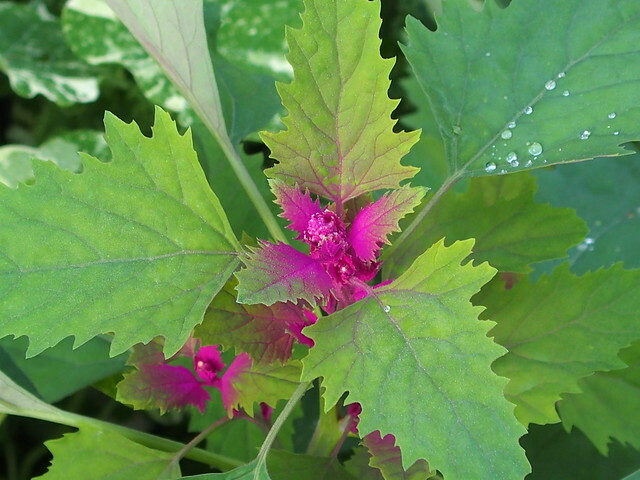 I have a couple of tree spinach (Chenodium giganteum) that self-seeded among the potatoes and which I transplanted into the salad bed. 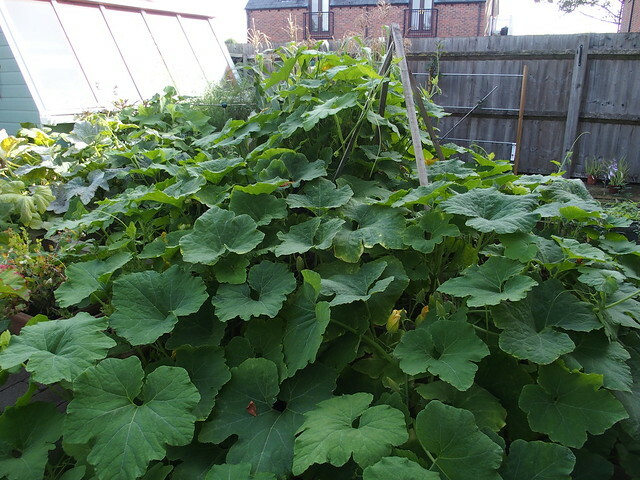 It’s a bit hard to navigate the garden at the moment, as the Shark’s Fin Melon has taken over. Last year I grew one in the strip (and we still haven’t eaten the fruits, and they are still perfectly fine), but this year I made the mistake of giving it a garden bed. This is the state of it after being trimmed several times. 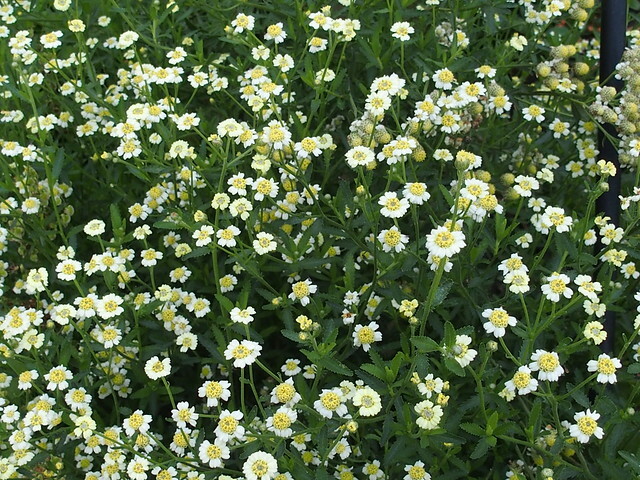 I certainly can’t recommend it as a plant for small gardens! I love how borage self-seeds. It always shows up in the nicest places.